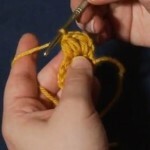 The Picot Stitch is a little decorative nub or loop that adds interest, and often texture, to crochet projects. It’s often seen on the points of crochet snowflakes and doilies, and on the borders of blankets. It’s also part several different stitch patterns. 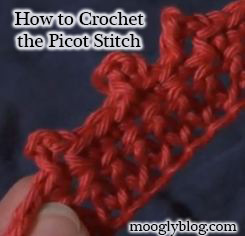 There are two different ways to make the picot stitch, both of which I demonstrate in this video. For the first version, chain 3 and insert the hook back through the center of the precious stitch, yarn over, and slip stitch. 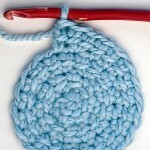 This creates a wider looking picot that’s firmly attached to your project. This version is great for blankets, washcloths, and other items that will get a lot of handling. For the second version of the picot stitch, chain 3 and then insert the hook into the back of the first chain, yarn over, and slip stitch. This is a narrower, pointer looking picot that works well on delicate projects like thread snowflakes and doilies. They’re a little fiddly at first, particularly when working with thread, but with practice they become just another stitch in your arsenal. 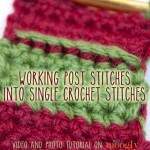 Picot stitches are a great way to add interest to your crochet project, and I hope you enjoyed learning about them! 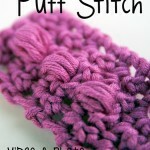 What do you think of the picot stitch – love it or hate it? 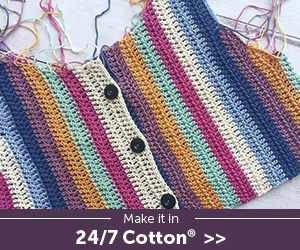 Do you have a favorite project or pattern that uses this stitch? Share it in the comments! P.S. The ‘magic ring’ is the best! Oh my gosh, thank you so much! That really made my night. 😀 I’m so glad!! Please, if there are any stitches you want to learn that you don’t see a video for here, let me know – I love taking requests! 😀 Awesome! Thank you Christine, I’m so glad to hear it! This is the one I am making.. I purchased a length of Italian crochet fabric to make a wrap with. It is light weight and lovely but I need to finish the cut or raw edges at both ends. It will remain the width of fabric due to those edges being finished. I purchased 100% cotton- Algodon in the same color to finish with, which is more like a heavy thread than a yarn.The fabric is very close to the same weight in construction. I am not an accomplished crocheter, but have crocheted in years past. Do you have any suggestions as to how to finish this wrap?